Apple can be a bit sensitive at times. Apparently they’ve told Newsday to pull a commercial from their website or else they would pull their app from the app store. The video is embedded below (at least until Apple makes Google pull it from YouTube). I guess they don’t like the idea of people smashing their iPad to pieces. 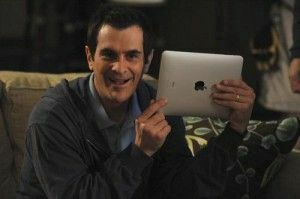 I think the video is really funny and actually doesn’t hurt the iPad brand at all, but I’m not Steve Jobs. Thanks to Consumerist for the story. If the ad happens to get pulled before you get a chance to see it contact me and I might be able to help you find it using other means. See also: my review of the iPad. UPDATE [5:34 PM CDT]: Apparently Newsday asked YouTube to pull the original video for copyright infringement, so I updated the video to another one. Let’s see how long this one stays up. I’ve been a Logos Bible Software user for a long, long time (since the mid-90s), but I’ve just recently jumped into the Mac world last summer. One of the things that was keeping me from making the switch was Logos being Windows only. I knew I could do parallels, Boot Camp, or something similar, but I didn’t like the idea of not having full access to the computer resources to run the software (that’s showing my geek card right there). But I took the jump last summer to Mac mainly because they announced a Mac version for their software. But the first attempt at the Mac version was a miss. So bad in fact I asked for a refund and they gave it to me. Logos has some of the best customer service I’ve ever dealt with. When they gave me the refund they told me they were working on a new version, which made me happy. That new version made its appearance unofficially last fall in alpha/beta testing stages. I’ve been using these versions and I can tell you from experience that it’s incredible. They’ve added some incredibly useful tools to make it easier to study your Bible and take your study as deep as you want to go. It’s amazing what you can find out with just a couple mouse clicks. Well, the official release of Logos 4 Mac is coming October 1 and they’re giving away some really nice prizes to celebrate. If you’re a Mac user and love the Bible you should really consider purchasing a copy of the software. A cool part of the software is that the license lets you use both the Mac and Windows versions of the software in addition to the cool Logos App for the iPhone/iPad. Check out the info below from Logos. Logos Bible Software is giving away thousands of dollars of prizes to celebrate the launch of Logos Bible Software 4 Mac on October 1. Prizes include an iMac, a MacBook Pro, an iPad, an iPod Touch, and more than 100 other prizes! They’re also having a special limited-time sale on their Mac and PC base packages and upgrades. Check it out! I’ve had my iPad for about six weeks now, so I thought I’d post some follow up thoughts to my initial review. Bottom line: I still love it!!! It’s extremely unusual for me to pull out my MacBook Pro (MBP) over the weekend now. Almost everything that I want or need to do I can do on my iPad, and usually do it quicker. It’s really convenient to pull it out and browse the web, check Facebook or Twitter updates, shoot off a couple emails, or play Angry Birds (I’m so addicted to that game). It’s been a great addition to my tech gadgetry. – Battery life: it’s flipping amazing. I can use it for about 4-5 hours and it only hits about 50% remaining power. I’ve never seen another device like it. – Noise: it’s completely quiet (except for pushing the home button). It’s not like the MBP has a jet engine or anything, but it does make some noise. Other laptops I’ve had in the past make even more noise, so having something that produces no noise from cooling fans is awesome, especially when the wife is sleeping next to me. – Heat: there is none. Again, this relates a lot to using the laptop in bed (which could probably be another post in and of itself), but the iPad NEVER GETS HOT! It’s awesome and I’m not sure how they pull it off. Even my MBP gets pretty hot to the touch at times. Not the iPad. 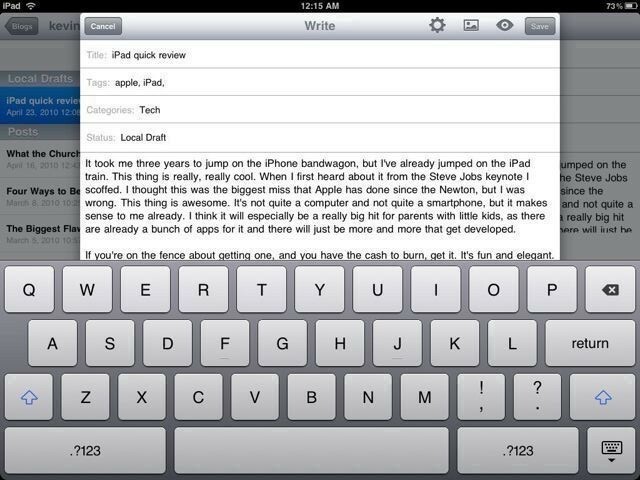 – Apps: even with the limited selection (for now) there are some really, really nice apps that take advantage of the amazing screen on the iPad. I really like the new Documents To Go app that was released June 1. It does everything I need for basic word processing and office apps (and syncs with Google Docs/DropBox/MobileMe). – Simplicity: it’s so simple a baby can use it (OK, maybe a toddler). I know because my two year old can turn it on, switch between app pages on the home screen, choose the app she wants to play, and make the apps do what they are supposed to do. It’s really amazing to see. – Social: it’s a magnet for discussions and better at being social. There have been quite a few times that I’ve been using it out in public and someone has come up and asked me about it. That happens with almost every new tech device, but this seems to happen quite a bit more and the conversations I’ve had have been longer and more in-depth. Pretty cool. Also, when I’m meeting with someone I can just set the iPad on the table and everyone at the table can see what’s on the screen and interact with it. It’s much more social than a laptop. It’s not a perfect device (hello, Apple: fix the wifi bug soon!!! ), but it’s quickly become my go-to computing device. If you need to print stuff frequently (I don’t) you probably won’t like it as much as I do. But if you’re looking for something that’s a lot of fun, easy to use, and just plain works I highly recommend picking up the iPad. I haven’t regretted it once. What about you? Do you have an iPad? What do you like or hate about it? If you don’t have one, are you planning on getting one? Why or why not? Share your thoughts in the comments below! It took me three years to jump on the iPhone bandwagon, but I’ve already jumped on the iPad train. This thing is really, really cool. When I first heard about it from the Steve Jobs keynote I scoffed. I thought this was the biggest miss that Apple has done since the Newton, but I was wrong. This thing is awesome. It’s not quite a computer and not quite a smartphone, but it makes sense to me already. I think it will especially be a really big hit for parents with little kids, as there are already a bunch of apps for it and there will just be more and more that get developed. If you’re on the fence about getting one, and you have the cash to burn, get it. It’s fun and elegant. It’s not perfect, but it’s still great. And yes, I did write this post from the WordPress app on my iPad.